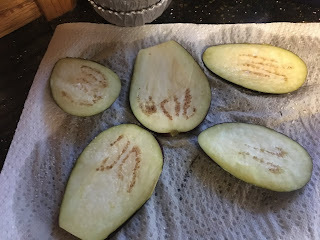 A shiny, dark purple eggplant from Barry’s garden became eggplant pizzas. Essentially it’s Eggplant Parmesan with just less sauce; consequently it rather crisp and pizza-like. Barry says it’s his favorite way to eat eggplant to date! Depending on the size of your eggplant, you may need to use more or less egg and/or breadcrumb mixture and the amount of sauce, sausage and mozzarella is up to your preference. Omit the sausage for a vegetarian dish. 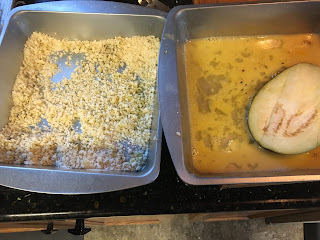 Prepare dredging stations: Combine the panko breadcrumbs, parmesan cheese, Italian seasoning garlic powder and a teaspoon of olive oil in a shallow dish. In a separate dish, lightly beat the eggs with the water. 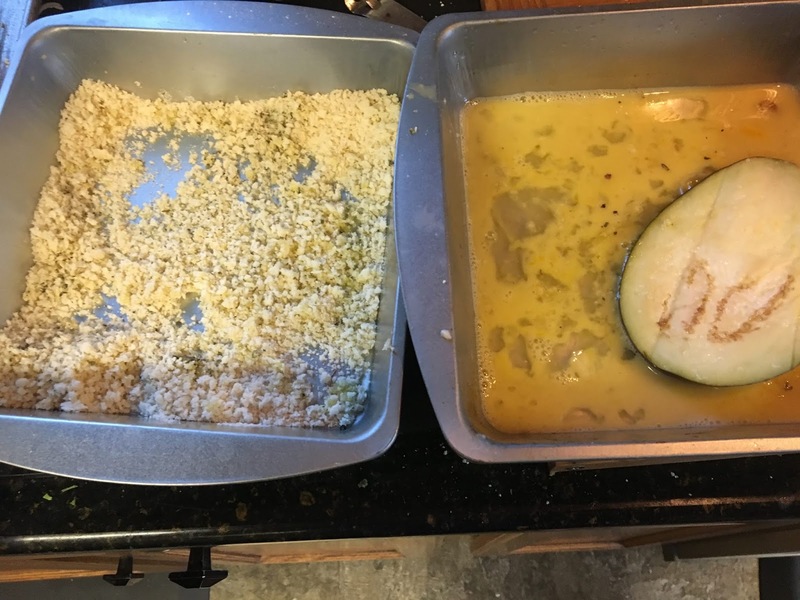 Dip the eggplant slices in the egg and then the breadcrumb mixture, pressing the breadcrumbs onto the eggplant to evenly coat both sides. Drizzle a sheet pan (with sides) with remaining olive oil and use a brush to spread it over the whole pan. Place the breaded eggplant in a single layer on the baking sheet. 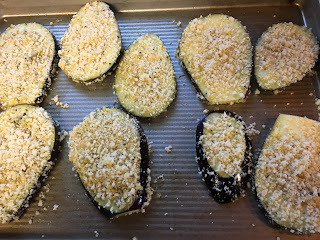 Bake in the preheated 375° oven for about about 20 minutes or until eggplant is almost tender and breadcrumbs are crisp. Spread a spoonful of chunky marinara over each eggplant, add a spoonful of cooked sausage and a slice of fresh mozzarella cheese. Return to oven for about 10 minutes until topping are hot and cheese is nicely browned. Bake in the preheated 375° oven for about about 20 minutes or until eggplant is tender.